Atlantis has docked with the International Space Station (ISS) on the final mission of the US space shuttle programme. It will spend at least seven days at the ISS and, on its return to Earth, will be retired along with the other shuttles in Nasa's fleet. Atlantis is taking vital supplies to the space station, including more than a tonne of food, ensuring astronauts there have got enough to last a year. The first shuttle mission was in 1981. 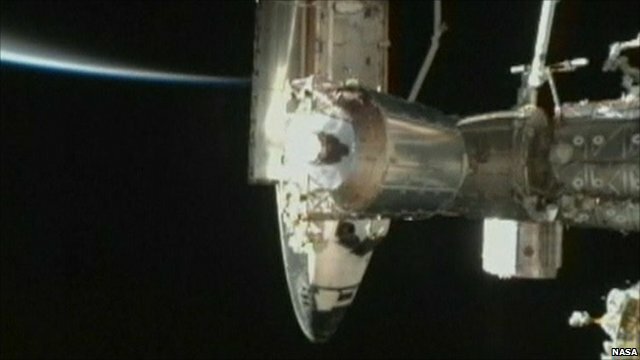 At 1507 GMT on Sunday, Nasa mission control in Houston announced: "Contact, docking confirmed." The naval bell on the ISS chimed to greet Atlantis. "Welcome to the International Space Station for the last time," ISS astronaut Ronald Garan said. Atlantis commander Chris Ferguson replied: "It's great to be here station, see you shortly." ISS astronauts photographed the shuttle as it did a backflip before docking, so that all of the craft can be studied for damage before its return to Earth. Atlantis is carrying the Raffaello Multi-Purpose Logistics Module, a large cylinder containing more than 3.5 tonnes of food, other supplies and spare parts designed to sustain the station. The cargo is to be lifted out of the shuttle's payload bay and attached directly to the station on Monday. The Atlantis and ISS crews will then be able to go inside Raffaello to begin the process of transferring its contents to more permanent storage positions on the platform. BBC science correspondent Jonathan Amos says the delivery has major significance. Once Nasa retires its shuttles, it will be relying on robotic spacecraft from private companies to make cargo runs to the ISS, he says. Just one spacewalk will be performed during this mission. This will be done by two of the station's residents, who will move an ammonia pump that recently failed on the station to the shuttle's payload bay. The pump is an important component in the ISS cooling system and it will be taken back down to the ground so engineers can understand why it stopped working. Atlantis is due to return to Earth on 20 July, bringing to an end Nasa's 30-year orbiter programme. Atlantis itself will be made safe for public display at the Kennedy Space Center visitor complex. 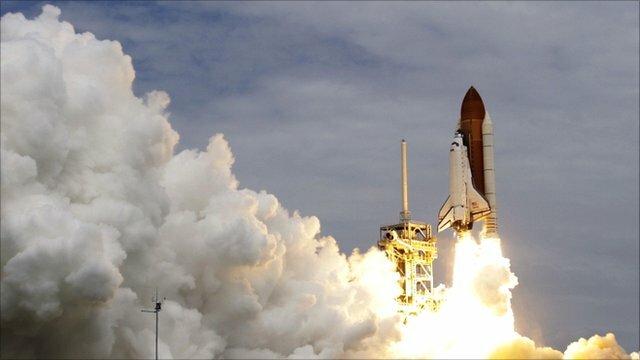 Nasa intends to use resources diverted from the shuttles to build a capsule capable of going to deep-space locations such as asteroids.